I was outside the polling place at PS 217 on Newkirk Avenue about 6:15am. The line was already two deep down the stairs out to the street. As I waited in the pre-dawn darkness, off in the distance we could hear a loud deep male voice shouting, but we could not make out what he was saying. Something about "president"… Then we could hear "Barack Obama! First black president!!" Finally, he emerged, riding slowly, weaving back and forth from one side of Newkirk Avenue to the other, calling out LOUDLY to each passer-by: "Barack Obama elected first black president!! Hello brother! Barack Obama first black president!!" It was a young guy riding a mountain bike. We made eye contact: "Hey big guy! Barack Obama elected first black president!!" "BARACK OBAMA!!" Lights flicked on in the apartment houses across the street. "BARACK OBAMA IN THE HOOD!! Bein’ elected first black president today!!" "BARACK OBAMA IN THE HOOD!! Bein’ elected first black president today!!" He traveled four blocks, toward the B train, calling out to one and all, before we could no longer make out his voice. The same female who had chided the young man sighed. "Looks like John McCain has sunk to a new low," she said. "I think there might be some undecided voters in that apartment house over there who might have just swung over to the McCain camp" I said. No sooner had I spoken then "the voice" started to grow louder again. A middle-aged man shouted out from an open window: "Hey! Shut up!" "BARACK OBAMA IN THE HOOD!! Bein’ elected first black president today!!" came the reply. "Hey! Shut the freak up!" came another, younger voice. "I was born by the river in a little tent, and just like that river, I've been running ever since. It’s been a long time coming, but I know a change is gonna come...There were times when I thought I could not last too long, but now I think I'm able to carry on. It's been a long time coming, but I know a change is gonna come oh yes it will." “A Change Is Gonna Come” was the flip side of “Shake”, a much bigger hit, but it still cracked the Top 40 in January 1965. Sam wrote the song in May 1963, after he spoke with sit-in demonstrators in Durham, North Carolina while on tour there, and maybe added a verse (that was edited out of the single) when he was arrested in October 1963 in Shreveport, Louisiana for disturbing the peace by trying to register at a “whites only” motel (“I go to the movie and I go downtown…Somebody’s tellin’ me don’t you hang around”). He didn’t record the song until January 1964 and didn’t release it until December of that year. 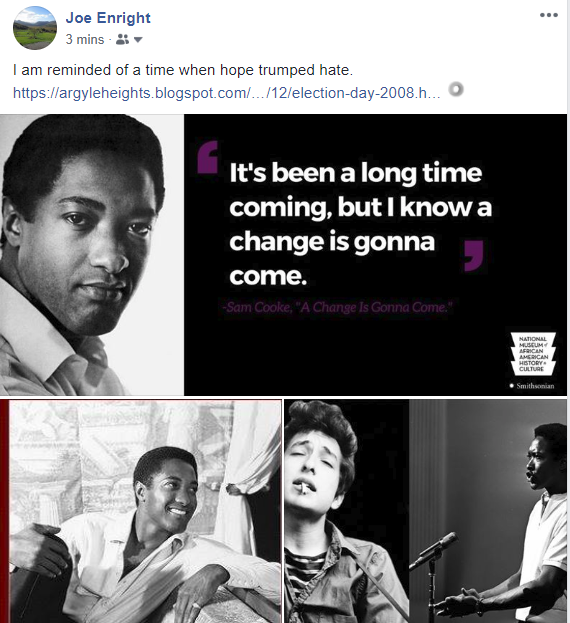 There are many different versions of this song, from Otis Redding to The Band, from Solomon Burke to the Neville Brothers, from Aretha Franklin to Bobby Womack, and even Bob Dylan, whose “Blowin’ In The Wind” convinced Sam that “protest” song-writing could be popular, singing it at the Apollo in 2004 (www.songsofsamcooke.com/DylanChange.wma). But the original will always be the greatest, because it features what the others don’t have: one of the most beautiful voices to ever bless this planet (www.rollingstone.com/news/story/6595857/a_change_is_gonna_come has a link to 25 free listens via Rhapsody). Anyway, “A Change is Gonna Come” was Sam Cooke’s last record – legend has it that it was being pressed for release the day he died. 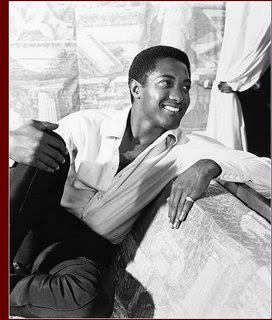 But as I drifted off to sleep, I couldn’t help but think that somewhere, somehow, Sam Cooke had a mighty big smile on his face. You have a knack for moving a story along through conversation- an important skill for writing novels.